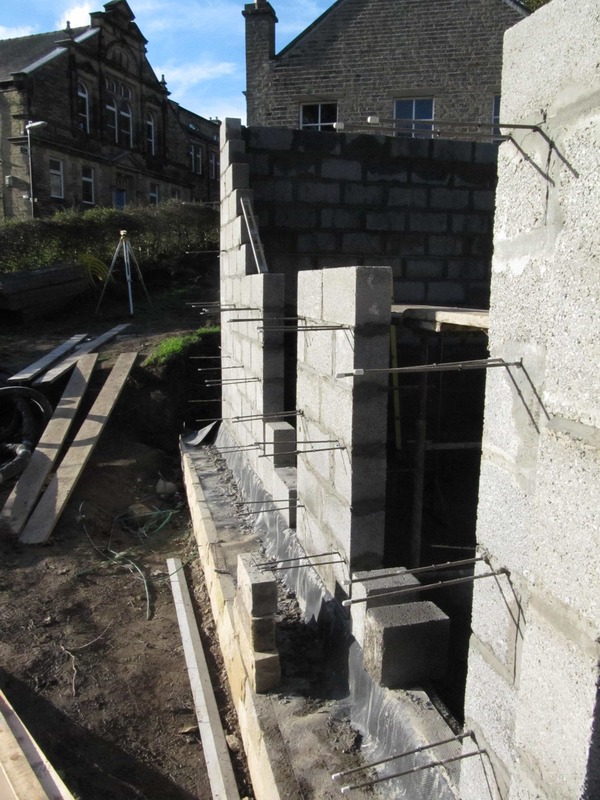 Blog looking at similarities & differences between the Golcar Passivhaus project and our previous cavity wall Passivhaus project at Denby Dale. 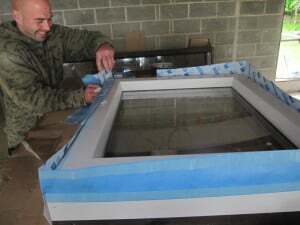 This week we have taken delivery of, and are installing, the windows and doors at the Golcar Passivhaus. We are using our forthcoming PROGRESSION A-rated timber (with cork) Passivhaus certified range, due to be officially launched in the Autumn. 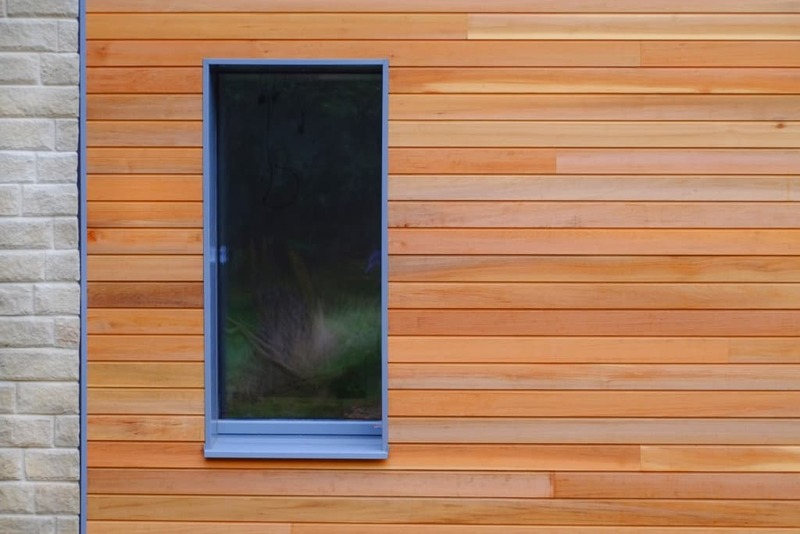 With slim sightlines (so the frame is virtually invisible from the outside) the windows are not only architecturally very pleasing but have the benefit of allowing greater solar gain over a more standard frame. The knock on effect is that our annual heating need, as shown to us in the Passivhaus software modelling for the house (PHPP), is considerably reduced. 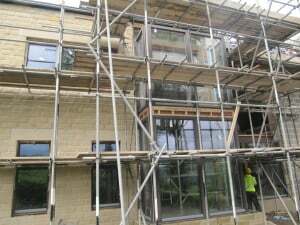 Although we have dramatic areas of glazing at the Golcar Passivhaus we do not have as higher ratio of glazed area to external envelope as at Denby Dale. Because of this we have ‘got away with’ using the cheaper mineral wool cavity wall batt with a lesser lamda value, again shown to us in the PHPP modelling. We are using Knauf Dritherm 37 as opposed to the 32 version we needed at Denby Dale. So, the wall insulation of the Golcar build is therefore offering a cost-saving over the Denby Dale project. 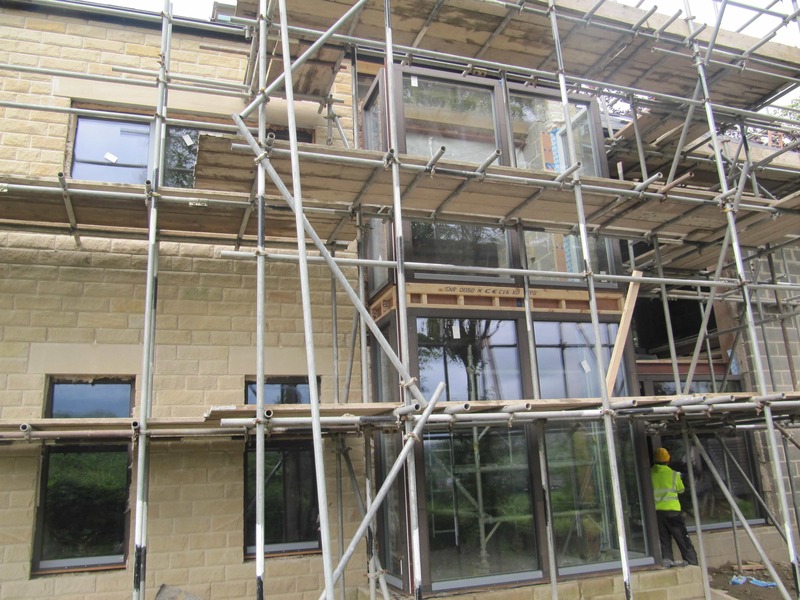 Due to the relatively large size of the house we reckon that overheating is not going to be an issue, due to the smaller proportion of glazing at the Golcar project. So we are not adding an overhang to the roof at Golcar. There might be an issue with overheating if the clients were not willing to open windows once in a while for purging the heat! 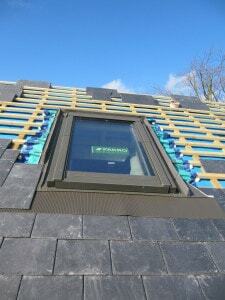 The Golcar Passivhaus has a lot of openable windows – including the rooflights. 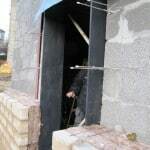 As at Denby Dale, we’re using plywood boxes to position the windows carefully within the cavity wall insulation. We have made a small tweak to this by painting the plywood boxes using quick drying primer paint to protect them from the rain/ moisture and to prevent any warping to the boxes during construction making window installation considerably more pain free. We’ve used the Compacfoam rigid insulation on the thresholds to the doors, the big glazed two storey screen and the bay windows as we felt that they’re too heavy for the plywood box system. On the Denby Dale house we just brought the concrete slab forwards because we felt that the plywood box was not strong enough to hold such a weight of the big windows in the solar space. What we’ve done at the Golcar Passivhaus is to put Compacfoam (which has excellent compressive strength) under the thresholds and large windows to reduce thermal bridging at those junctions and to give us a robustness for foot traffic. 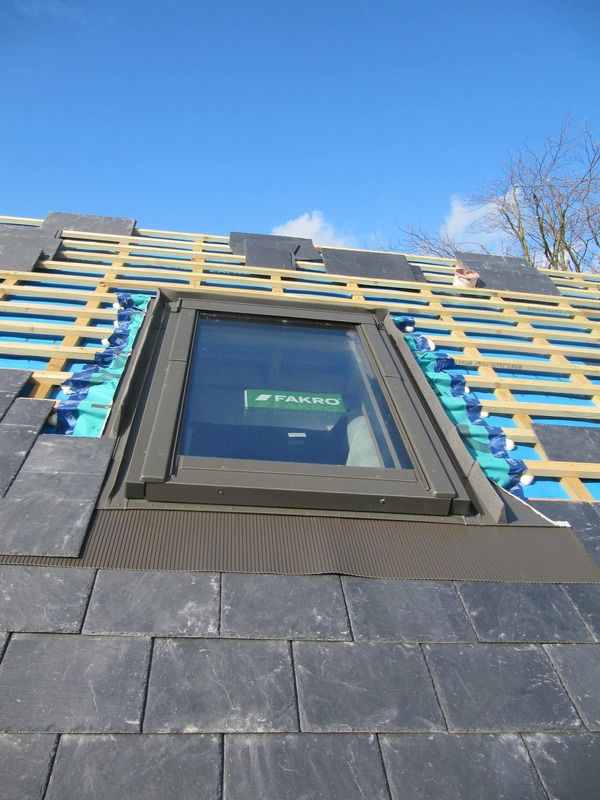 We’re using 2 X 150mm batts of mineral wool (Knauf Dritherm 37 ) in the cavity – rather than 3 X 100mm – as the feedback from Lancaster Co-Housing cavity wall Passivhaus project was that 150mm batts were easier to use. We build the inner leaf of the cavity wall first allowing it to ‘go off’ then build up the stone outer leaf 450mm at a time before installing a row of insulation batts. If the two masonry leaves are ‘thrown up’ too quickly and high, rain can expand the cavity batts slightly pushing the ‘green’ masonry apart. 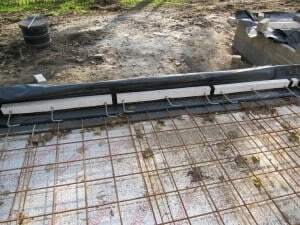 In the next blog we’ll look at the floor junctions & strategy for the warm roof. I am wondering how wide your cavity is? Mid way in the cavity is the best position for the window thermally but leaves the complication of how to close the external reveal. We’ve used powder coated aluminium, a relatively expensive solution although robust. I am assuming your suggestion of fitting windows closer to the inner leaf still leaves this problem of closing the cavity? In answer to your question I would consider either brackets or ply box, however for ease of fitting and a straight forward airtightness strategy I would chose the ply box. Incidentally with our present Kirkburton masonry cavity Passivhaus we are positioning the window ‘in check’ behind the outer stone leaf, resting on a Compac foam batten bolted into the back of a stone cill. We still have big ply boxes but felt the window, particularly the larger ones, needed extra support being so far from the inner leaf. This simplifies the install and the look. The disadvantage is the considerably worse thermal edge loss but we cope with this by using the better Progression window system and compensating with good detailing at all other junctions.